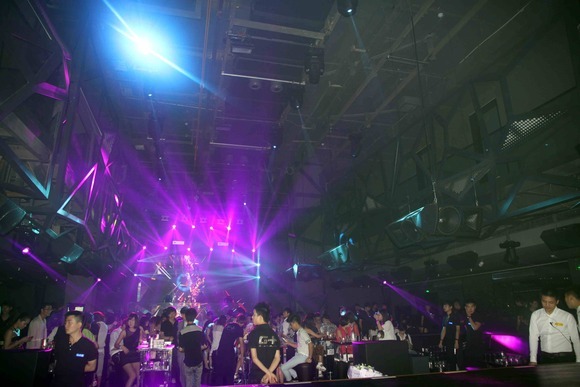 HANGZHOU, China – The G+ Club, known as “the biggest bar in Asia” with an area of over 20,000 square feet, recently opened in Hangzhou, China. Even more impressive is the audio system: a full lineup of HARMAN’s JBL Marquis Dance Club Series loudspeakers, JBL Control CRV loudspeakers, JBL ASB subwoofers, Crown I-Tech HD amplifiers, AKG microphones, Soundcraft digital consoles, BSS Audio signal processing and Lexicon effects processing. The G+ Club is decked out from top to bottom. The JBL Marquis Dance Club loudspeakers are stacked in tight spaces and also suspended from the ceiling for maximum coverage of multiple floors. The Marquis Dance Club Series is specifically designed for powerful, high-energy, high-performance entertainment venues such as nightclubs and bars. To complement the 18 MD52 loudspeakers and the 48 MD55 loudspeakers, the club also features a total of 16 JBL ASB6125 subwoofers, six JBL ASB7118 subwoofers, 16 JBL ASB7128 subwoofers, 12 JBL Control CRV loudspeakers, 16 Crown I-Tech 4x3500 HD amplifiers and eight Crown I-Tech 12000 HD amplifiers. HARMAN is not only renowned for its leading position in audio technology but also in systems integration solutions. The BSS BLU-800 signal processor, Lexicon MX400XL effects processor and the Soundcraft GB4 mixer are powerful additions able to support any major club environment. Two AKG DSR700 and four DHT700 wireless microphones round out the system.